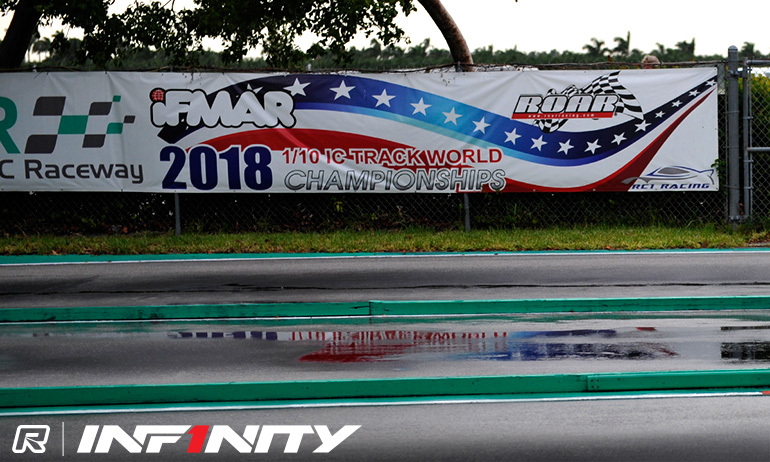 Rain halted the final round of practice at the 1:10 200mm World Championship in Florida. A heavy shower stopped proceedings at Homestead RC Raceway half way through what was to be the drivers fourth practice of the second official day of the event. Having also ran 4 rounds of practice yesterday, officially it is Mugen’s Robert Pietsch who has produced the fastest time of practice ahead of reigning World Champion Dominic Greiner and Jesse Davis. With overnight rain washing away traction built up during the International Practice Days and yesterday’s first round of official practice, today’s times were slower. After respraying the track with sugar water this morning it was Greiner who was fastest in the first round from 200mm rookie Naoto Matsukura. 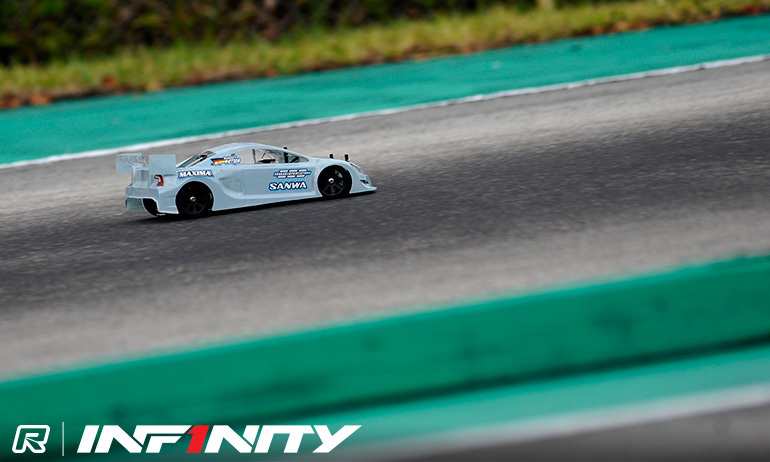 The Japanese driver went to the top in the next round ahead of team-mate Tadahiko Sahashi while what was to become the last run of the day for the leading drivers produced an Infinity 1-2-3 led by Lamberto Collari from Matsukura and Sahashi with Greiner fourth. For the day it was Matsukura’s FP6 time that was the fastest of the day registering a 53.890-seconds 3-consecutive lap time compared Pietsch’s 53.668 from the previous day’s rocket round FP4. Commenting on his day, Greiner was frustrated to miss out on the fourth run having struggled with his car as the grip came up over the day. The Serpent driver said, ‘today was very strange. We had less grip because of the rain overnight (and in the first practice) my car was OK. I was fastest and it was consistent but over the day the balance changed completely’. He continued, ‘I had too much steering. I changed it to make the it more stable in the rear but it got worse. Now we have rain again when the last practice was going to be important for me as I was going to try a big change. I’m a little frustrated because my car has oversteer but others in the team with the same set-up have understeer. I think it’s the practice tyres so we will see tomorrow when everyone is on handout tyres. It should be the same for everyone tomorrow but the traction is gone again with the rain so it’s going to be a new game’. At the track where he took his biggest career win, the 2011 1:8 Onroad World title, Pietsch said, ‘yesterday was good but they had to spray the track today and it was different. In the last run we did, it was almost the same conditions as yesterday but my driving today was not decent’. Top Qualifier when the 200mm Worlds was last held in the US in 2010, the German hopes organisers have learnt from last night’s overnight rain experience saying, ‘they have some experience of the rain now so I hope they spray earlier because it was not completely dry when we started. In my opinion they should run one free practice round before starting the controlled practice’. On his car he said, ‘the car & engine are good so I will keep it the same for tomorrow and see what happens with the track conditions’. Making his 200mm race debut in Homestead a year on from an impressive 1:8 Onroad debut at the Worlds in France last year when he won Super Pole to qualify into the final, Matsukura was very upbeat about the 200mm class. The multiple Electric World Champion said, ‘It was first race in 200mm and it’s not bad. 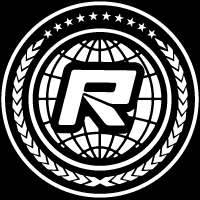 I like it especially because it’s racing on foam tyres’. After suffering ‘some problems yesterday in the first 3-rounds’ he summed up today’s performance as ‘very good’. Having tested here last week, excluding him from doing IPD, the Japanese driver said ‘we went to the set-up from last week for today and I had a much better driver feeling but we still need to find more in the set-up. I need to make a little more stable in the rear and get a little more steering’. Asked what he thought of the track he replied, ‘It is more Japanese style, I like it. You have to drive tight and there is a black line that is very important to stay on, because off it there is little grip’. Not a track he has fond memories of in 1:8, his fourth consecutive title coming to an end here in 2011 when he retired from the Semi Finals, Collari summed up his practice performance as ‘not bad for my first important race in 1:10’. 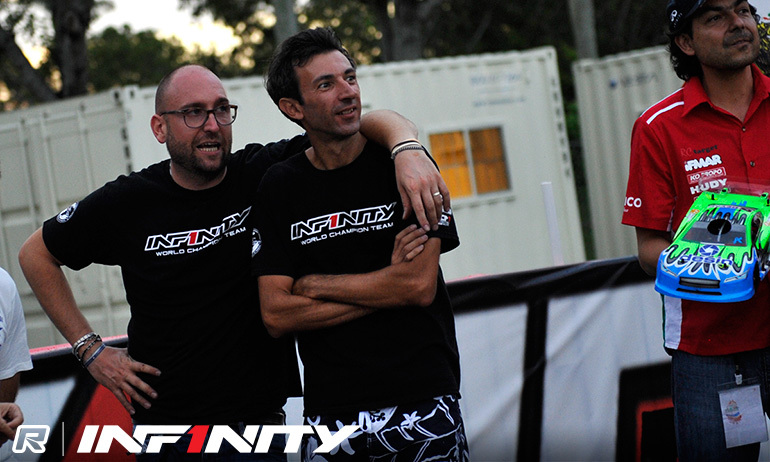 Having made his 1:10 race debut in the opening round of the Euro Nitro Series this season, the 9-time 1:8 World Champion said his car was working good having had ‘some days (testing) here’ prior to the event along with some of his Infinity team-mates. The Italian added that the testing had ‘improved my experience with the adjustments of the car’. Looking to tomorrow’s four rounds of controlled practice, two to count towards seeding for qualifying, he said, ‘the set-up of the car is good after today but it depends on the conditions in the morning so we might just change the diff oil if needed’. 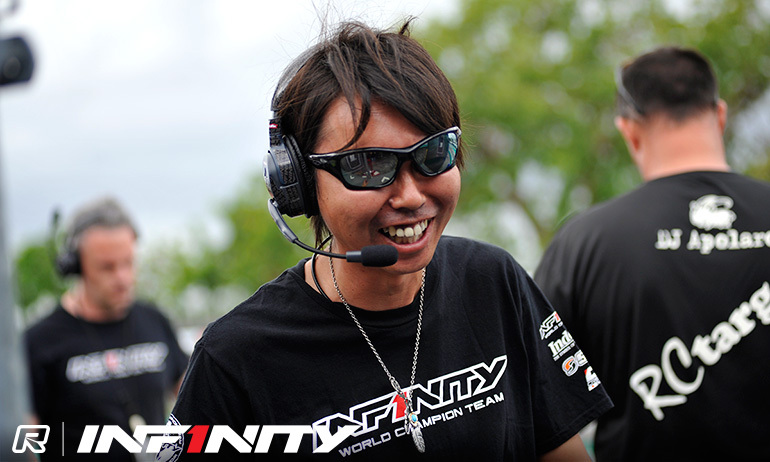 Another former 1:8 World Champion in the mix today and making his international debut for Infinity at the event along with brother Yuya, Tadahiko Sahashi said he still needs to work more on the set-up but ‘today the result is good’. Having tested at the Homestead track back in August, he said the track had more grip but part of the issue now is the handout tyre is of a harder shore. 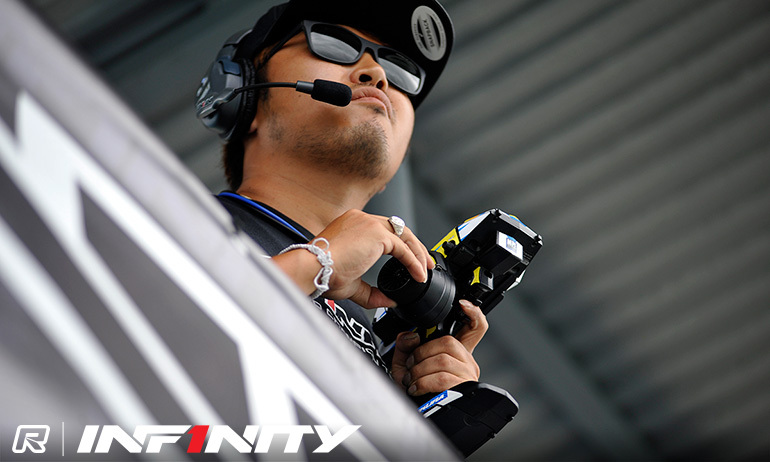 Like fellow countryman Matsukura, he also likes the track’s similarity to Japanese tracks having to drive tight to the corners. Something that requires a lot of bottom end power he said the 100m long straight then presents a challenge as top end power is also important. During tomorrow’s controlled practice he will work on trying to get the car’s rear end more stable.